American Wrestlers are much more than the sum of their influences on "Goodbye Terrible Youth"
If any band I’ve heard in recent memory is the musical embodiment of the adage, “You are what you eat,” it’d be St. Louis indie-pop band American Wrestlers. While imitation is often considered the sincerest form of flattery, most bands that come across my desk put a healthy buffer between themselves and their influences. There’s a certain reluctance to point out how or who they’ve been inspired by -- perhaps to avoid comparisons, or maybe to seem more original than they actually are. After all, no one wants to be derivative, right? Well, American Wrestler’s frontman/chief songwriter, Gary McClure, has no qualms with putting it all out there. The band’s sophomore album, “Goodbye Terrible Youth” (released last November via Fat Possum), is a perfect marriage of the aforementioned ‘90s-era distortion, Slowdive/Ride-esque shoegaze, and power-pop hooks that would sound right at home on a Manic Street Preachers record. But the band is much more than just the sum of their influences. Cue the new record’s “Amazing Grace,” which kinda sounds the way a perfect buzz feels -- pure magical, melodic gold. It wasn’t always this way though: McClure (who moved from Scotland to St. Louis, Missouri in 2014) spent the last couple years posting lo-fi, home-recorded pop nuggets to his Bandcamp account before American Wrestlers really started to take shape. More musicians joined the fold (his wife Bridgette Imperial plays keyboards, Ian Reitz plays bass, and Josh Van Hoorebeke plays drums), and McClure subsequently focused on writing bigger songs to accommodate the heftier lineup -- and he done good. If “Goodbye Terrible Youth” is just the start of the songwriter getting back in touch with his influences, the future seems very bright indeed. 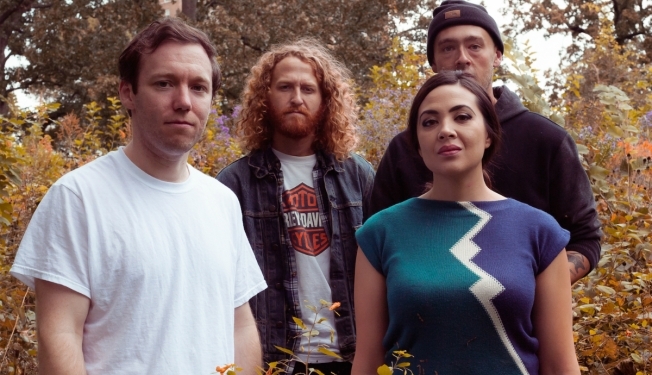 American Wrestlers play Soda Bar on Thursday, Jan. 19 with Lightning Cola and Aviator Stash. Tickets are $10 and they’re available online here.